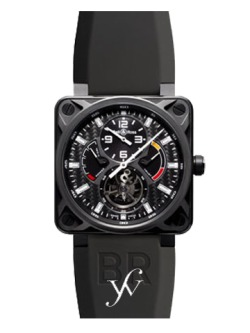 Bell & Ross BR 01 Tourbillon Limited Edition Watches. 46mm virtually unscratchable anallergic titanium with DLC (Diamond Like Carbon) case, carbon fiber dial, manual winding tourbillon movement with with regulator, power reserve indicator, and trust index, approximately 120 hours of power reserve, black rubber strap with black titanium DLC finish pin buckle. Water resistant to 100 meters. Functions: manual winding tourbillon movement with with regulator, power reserve indicator, and trust index, approximately 120 hours of power reserve, black rubber strap with black titanium DLC finish pin buckle. Water resistant to 100 meters.